Decor, square footage, and layout of stateroom may vary depending on deck and location. Staterooms and Suites with the VIP Experience will receive additional perks as defined in the VIP amenities section. 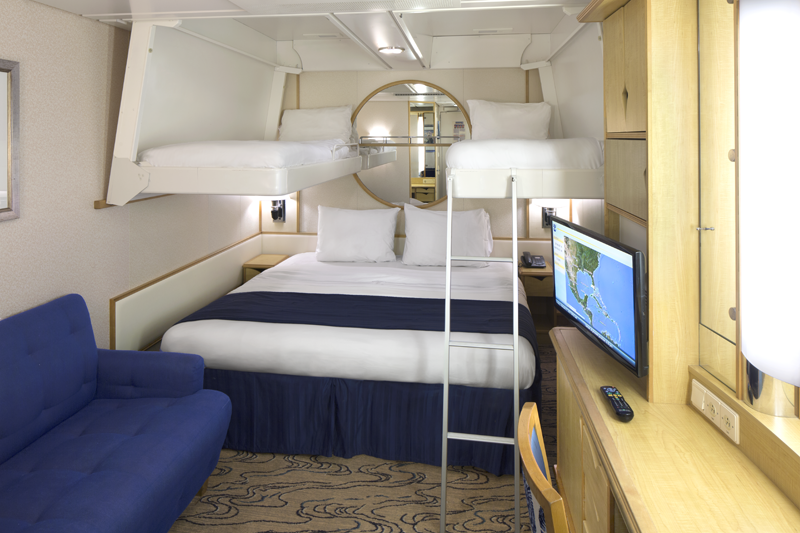 Interior Staterooms have two twin beds that convert to a Royal King (measuring 72.5 ” x 82″). Each stateroom includes a bathroom with shower, hair dryer, TV, Mini-Bar, Safe, Climate Control, Telephone* and Internet Connection. * Can accommodate 1, 2, 3 or 4 guests. Beds for third and fourth passenger are pull down bunks. Decks: 3, 6, 7, 8, 9, & 10 | Approximate Size: 160 sq. ft. Interior Staterooms with a bowed window seat with a view of the Royal Promenade. These staterooms have two twin beds that convert to a Royal King (measuring 72.5 ” x 82″). Each stateroom includes a bathroom with shower, hair dryer, TV, Mini-Bar, Safe, Climate Control, Telephone* and Internet Connection. * Can accommodate up to 2 guests. Decks: 6, 7, & 8 | Approximate Size: 167 sq. ft. These staterooms have a large window and two twin beds that convert to a Royal King (measuring 72.5″ x 82″). Each stateroom includes a bathroom with shower, hair dryer, TV, Mini-Bar/Refrigerator, Safe, Climate Control, Telephone* and Internet Connection. * Can accommodate 1, 2, 3 or 4 guests. Beds for third and fourth passenger are pull down bunks beds. Decks: 2, 3, 6, 7 & 9 | Approximate Size: 161 sq. ft. 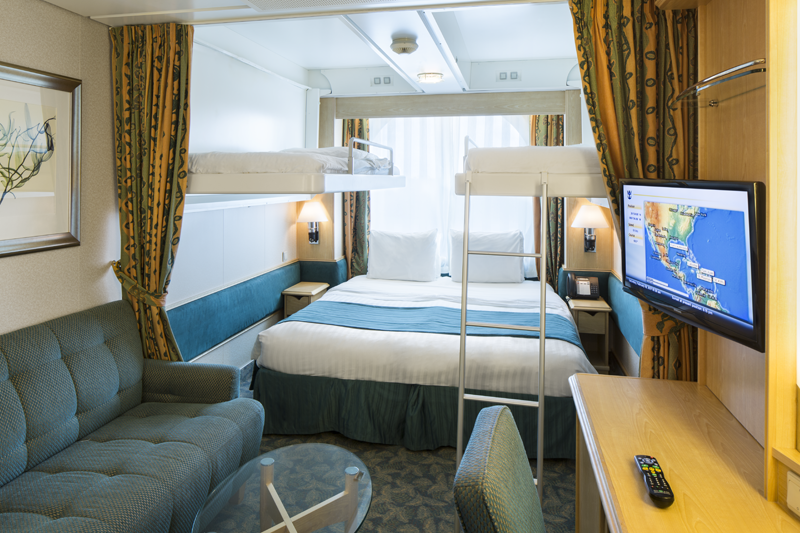 These staterooms have a large window and two twin beds that convert to a Royal King (measuring 72.5″ x 82″). Each stateroom includes a bathroom with shower, hair dryer, TV, Mini-Bar/Refrigerator, Safe, Climate Control, Telephone* and Internet Connection. * Can accommodate 1, 2, 3 or 4 guests. Bed for third and fourth passenger is a double sofa bed. Due to very limited availability, guests interested, should join the waitlist and book another category of their choice. If this cabin is available, they will be contacted – Bookings not available online or via phone. Decks: 6, 7, 8 & 9 | Approximate Size: 211 sq. ft. These staterooms have floor to ceiling wrap around panoramic windows and two twin beds that convert to a Royal King (measuring 72.5″ x 82″). Each stateroom includes a bathroom with shower, hair dryer, TV, Mini-Bar/Refrigerator, Safe, Climate Control, Telephone* and Internet Connection. * Can accommodate 1, 2, 3 or 4 guests. Bed for third and fourth passenger is a double sofa bed. Deck: 12 | Approximate Size: 191 sq. ft.
Staterooms have a large window, two twin beds that convert to a Royal King (measuring 72.5″ x 82″), bunk beds located in a separate area, a separate sitting area with sofa bed, and a bathroom with shower. Each stateroom includes a bathroom with shower, hair dryer, TV, Mini-Bar, Safe, Climate Control, Telephone* and Internet Connection. * Can accommodate 1 – 6 guests. Beds for additional guests are a double sofa bed and 2 pull down bunks beds. Decks: 6, 7 & 8 | Approximate Size: 328 sq. 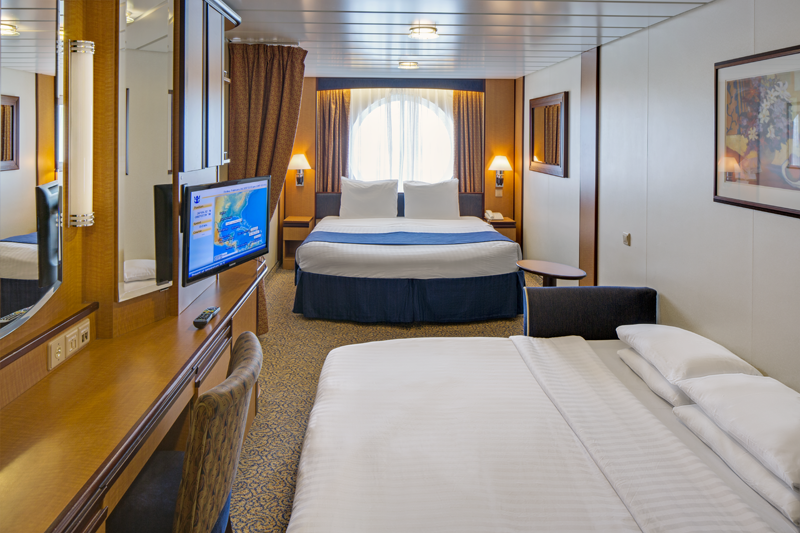 ft.
Staterooms have two twin beds that convert to a Royal King (measuring 72.5″ x 82″). Each stateroom includes a bathroom with shower, hair dryer, TV, Mini-Bar, Safe, Climate Control, Telephone* and Internet Connection. * Can accommodate 1, 2, or 3 guests. Bed for third passenger is a pull down bunk. 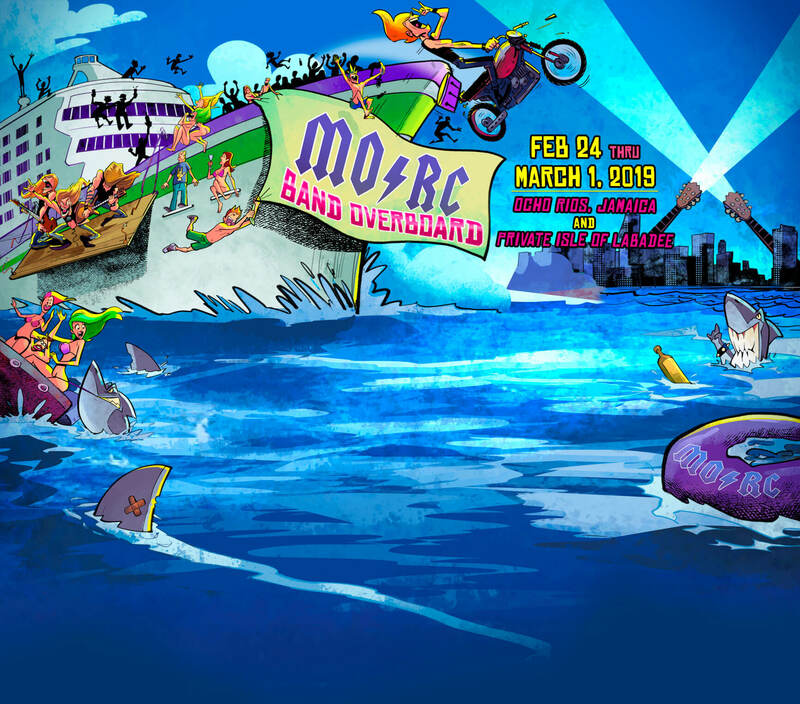 Some staterooms may have a partially obstructed view. 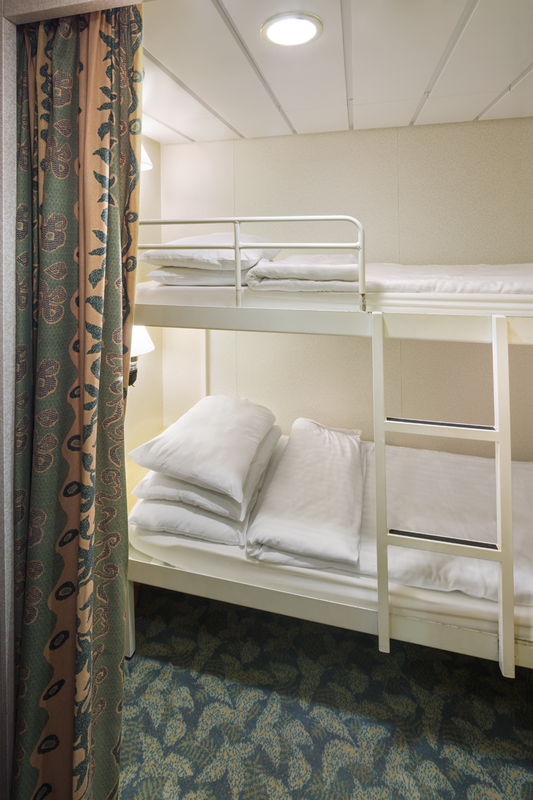 Staterooms have two twin beds that convert to a Royal King (measuring 72.5″ x 82″). Each stateroom includes a bathroom with shower, hair dryer, TV, Mini-Bar, Safe, Climate Control, Telephone* and Internet Connection. * Can accommodate 1, 2, 3 or 4 guests. Bed for third and fourth passengers is a double sofa bed. Staterooms include the Silver VIP Experience. This stateroom has two twin beds that convert to a Royal King (measuring 72.5″ x 82″). Each stateroom also includes a bath with shower, hair dryer, TV, Mini-Bar, Safe, Climate Control, Telephone* and Internet Connection. * Staterooms sleep up to 4 guests. Bed for third and fourth passengers is a double sofa bed. Staterooms include the Silver VIP Experience and have floor to ceiling panoramic windows and two twin beds that convert to a Royal King (measuring 72.5″ x 82″), curtained section with bunk beds, a living room with a double sofa bed, vanity sitting area and one and a half baths. Each stateroom includes a bathroom with shower, hair dryer, TV, Mini-Bar/Refrigerator, Safe, Climate Control, Telephone* and Internet Connection. * Can accommodate up to 6 guests. Decks: 2, 3, 4, & 7 | Approximate Size: 406 sq. ft. Junior Suites with the Silver VIP Experience include a sitting area with sofa bed, two twin beds that convert to a Royal King (measuring 72.5″ x 82″). Each stateroom also includes a bath with bathtub, hair dryer, TV, Mini-Bar, Safe, Climate Control, Telephone* and Internet Connection. * Junior Suites sleep up to 4 guests. Bed for third and fourth passengers is a double sofa bed. Accommodating up to 4 guests, the Grand Suites include the Gold VIP Experience. The Grand Suites have two twin beds that convert to a Royal King (measuring 72.5″ x 82″), a bath with bathtub and double sink, vanity area, hair dryer, TV, Mini-Bar, Safe, Climate Control, Telephone* and Internet Connection. * Grand Suites sleep up to 4 guests. Bed for third and fourth passengers is a double sofa bed. *Guests that indicate they are interested in Suites when prompted during booking, will be contacted for an upgrade, if available – Bookings not available online or via phone. Accommodating up to 4 guests this suite includes the Gold VIP Experience and access to the Concierge Lounge. The Owner’s Suites have a queen bed, a bath with whirlpool tub, double sink, separate shower and bidet, separate living room with queen-size sofa bed, hair dryer, TV, Mini-Bar, Safe, Climate Control, Telephone* and Internet Connection. * Grand Suites sleep up to 4 guests. Bed for third and fourth passenger is a queen sofa bed. Accommodating up to 4 guests this suite includes the Gold VIP Experience and access to the Concierge Lounge. The Royal Suite includes a separate Master bedroom with a king-size bed, private balcony, a bath with whirlpool tub, double sink, separate shower and bidet, steam shower, separate living room with queen-size sofa bed, hair dryer, TV, Mini-Bar, Safe, Climate Control, Telephone* and Internet Connection. * Bed for third and fourth passenger is a queen sofa bed. Prices are subject to change. Decor, square footage and layout of cabins may vary depending on deck and location. Please note while some staterooms may accommodate up to 4 guests, not all staterooms can do so. 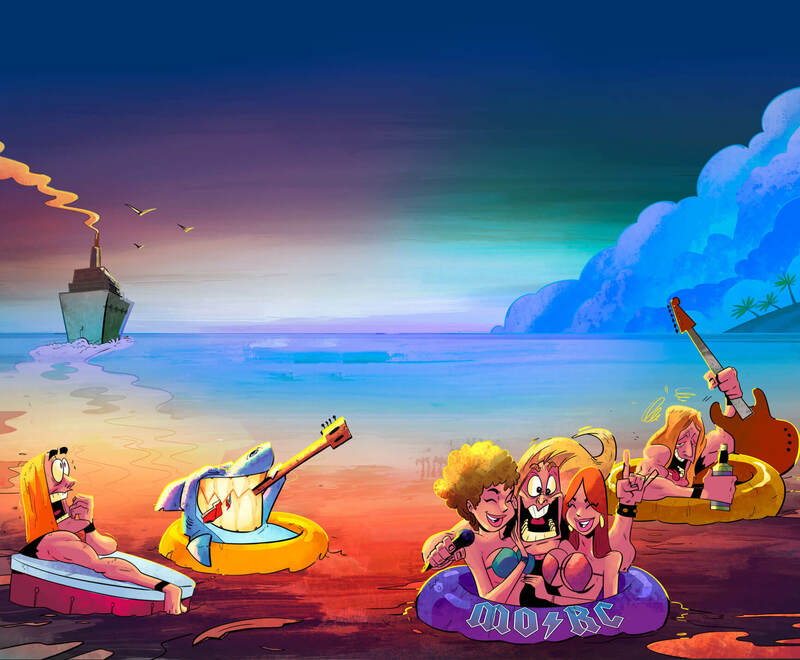 Availability of cabins that can accommodate more than 2 guests can only be guaranteed at the time of booking.